The Swiss Ramble: How Can Barcelona Afford Cesc Fabregas? 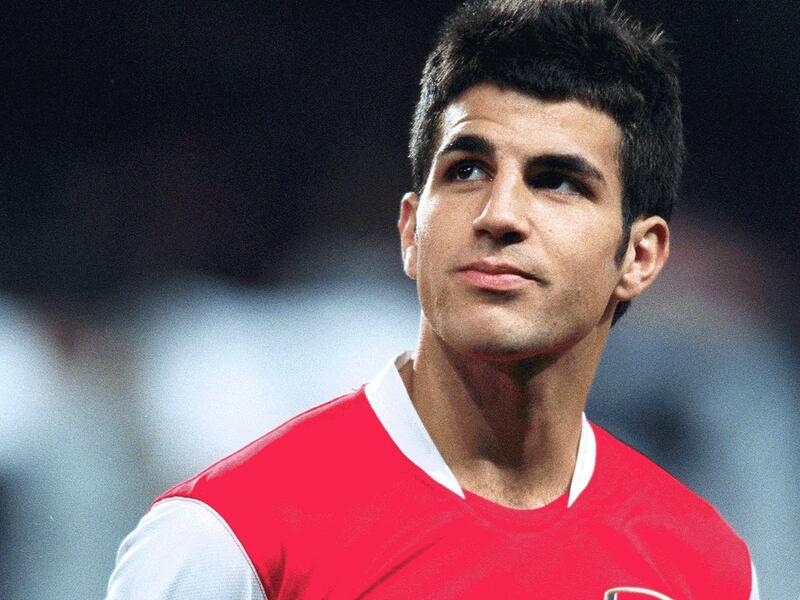 How Can Barcelona Afford Cesc Fabregas? 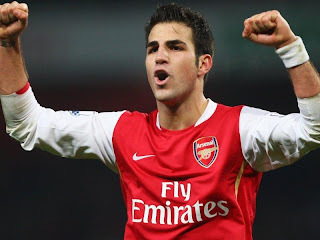 For the past few days there has been intense speculation about whether the Arsenal captain Cesc Fabregas will make his long-anticipated return to Barcelona, the team who brought him through their famed academy system. Trying to discern fact from fiction is extremely difficult, but the question that concerns me is exactly how Barcelona can afford to buy him, especially now that one of the Catalan club’s own presidential candidates has described the club’s level of debt as “stratospheric”. Barcelona has already spent £34m this week to secure prolific striker David Villa from Valencia, while they splashed out around €90m last summer on bringing new players to the Camp Nou, including the mercurial forward Zlatan Ibrahimovic, the unpronounceable defender Dmytro Chygrynskiy and two Brazilians: the veteran full-back Maxwell and the promising striker Keirrison. Estimates of a transfer fee for Fabregas have ranged from a ridiculously low £30m to an optimistic £80m, but whatever the price, I think it’s worth looking at whether Barcelona are “mes que un club” from the financial viewpoint. "Future team mates at Barca?" (a) We will look at the last set of annual accounts, not the more recent interims, as they do not contain the wealth of detail of the full-year figures. 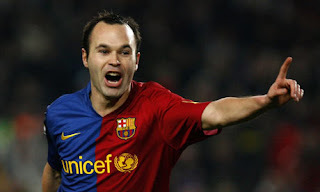 These cover the 2008/09 season, though Arsenal’s accounts are for the twelve months until 31 May 2009, while Barcelona closed their books a month later on 30 June 2009. 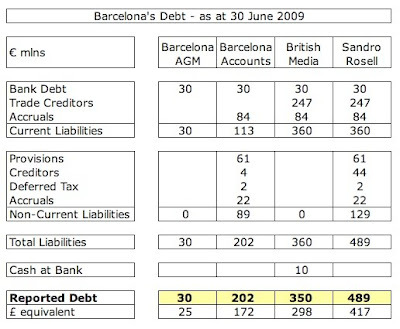 (b) Unsurprisingly, Barcelona’s financial statements are as per the Spanish National Chart of Accounts, which is very similar to the British format, but not exactly the same, so I have slightly amended their presentation to enable like-for-like comparisons. (c) I have excluded Arsenal’s property development business, as this is a temporary activity for Arsenal, which should come to a (happy) end in the near future. (d) However, I have included Barcelona’s non-football sporting activities (basketball, handball and hockey), as this is normal business for the club. In any case, it is not significant to their revenue (only £1.3m in total), though the costs are more of a drain, reducing last year’s profit by £24.3m. (e) Currency movements can play a big part in the comparison with the Pound around 25% lower against the Euro than two years ago, even after the recent collapse of the Eurozone currency. This means that Barcelona’s revenue in Sterling terms is now much higher than it was. For convenience, I have used the same exchange rate as Deloittes in their 2010 Money League, namely €1.1741. The first point to note is that both clubs make money, which is a rarity in the world of football. 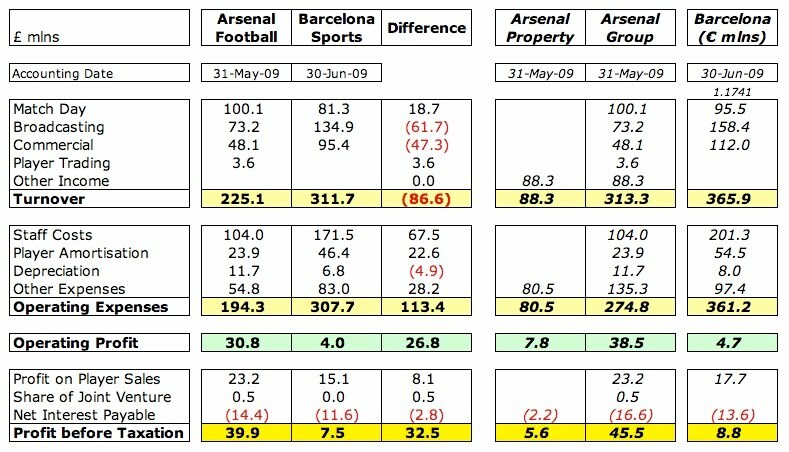 Barcelona’s profit before tax was a highly respectable £7.5m (€8.8m), but Arsenal’s was even more impressive at £39.9m, even after excluding £5.6m from property development. This difference may be down to a divergence in strategy, as Barcelona’s approach appears to be to remain profitable, but only just, as they spend available money on strengthening their squad. However, when Barcelona vice-president Joan Boix describes the club’s economic model as “solid and sustainable, independent of any sporting success”, it sounds uncannily similar to the Arsenal ethos. Having said that, you would expect their figures to be good after an incredibly successful season, during which the Catalans won the Champions League and the domestic double of La Liga and Copa del Rey. 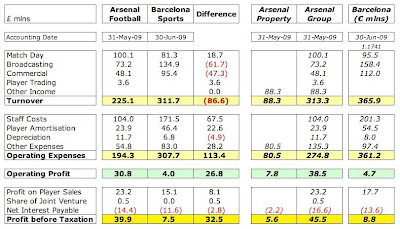 In comparison, Arsenal did not win any trophies, but their report card was not too shabby either: reaching the Champions League semi-finals, finishing fourth in the Premier League and reaching the semi-finals and quarter-finals of the FA Cup and Carling Cup respectively. However, there is an enormous difference in revenue with Barcelona generating an incredible £311.7m (€365.9m), which is £86.6m (or nearly 40%) more than Arsenal’s £225.1m. To put that into context, Arsenal’s turnover is the second highest in England and the fifth highest in Europe. I should mention that Barcelona report their turnover as €384.8m, as they include profit on player sales, but this is shown separately in British accounts, which is the approach I have taken. Deloittes used the same assumption in compiling their Money League. Even though the Camp Nou has a far larger capacity (98,800) than the Emirates (60,400), Arsenal’s match day revenue of £100.1m is actually £18.7m higher than Barcelona’s £81.3m. This is due to a couple of factors. First, Arsenal fill their stadium (or at least sell all the tickets), while Barcelona’s average attendance is 76,000, which is only 77% of capacity. More importantly, Arsenal’s ticket prices are among the highest in Europe, including 9,000 premium seats that generate approximately 35% of match day revenue, though any continued lack of success in terms of winning trophies might adversely affect demand at this level. Of course, the Emirates is a brand new stadium with state-of-the-art facilities, while the Camp Nou is a venerable old ground in need of a facelift. Barcelona had planned a €250m redevelopment, adding 10,000 seats and improving corporate facilities, which would have increased revenue, but this has been postponed after complaints from local residents. In contrast to Arsenal, Barcelona do collect good revenue from pre-season tours and lucrative friendlies. For example, their tour to America plus a friendly match in Kuwait produced over £6m. They also receive money from over 170,000 members, though this is not a significant factor, only delivering £15.1m. However, in broadcasting revenue there really is no comparison. Although Arsenal’s TV revenue of £73.2m is nothing to be sniffed at, Barcelona’s £134.9m is virtually double the size, thanks to the unique ability of Spanish clubs to negotiate individual deals in contrast to the Premier League’s collective bargaining system. This means that Barcelona earn around €120m in television rights from their deal with Mediapro, which runs until season 2012/13, but the other, smaller teams earn considerably less. For example, Valencia and Sevilla only earn €30m and €20m respectively. Apart from the obvious financial benefits, this has another advantage to Barcelona (and Real Madrid), as it makes it almost impossible for the other teams in Spain to compete with them, allowing the big two to prioritise the Champions League. Even though Arsenal, like other Premier League clubs, will receive an additional £7.5m a year from next season following the recent overseas rights deal, they are still greatly disadvantaged relative to the Spanish giants. 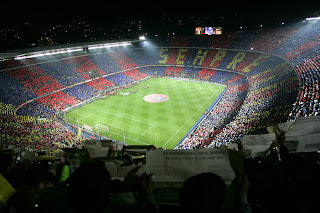 Joan Boix has said that Barcelona “only budget for the team to reach the quarter-finals of the Champions League”, so their revenue got a boost when they won it in 2009, though their share of the revenue distributed by UEFA (€31m) was not much higher than the €26.8m received by Arsenal. Although they were given €7m more for winning the competition, Arsenal’s share of the TV pool was €3.1m higher, as the English TV market is larger. 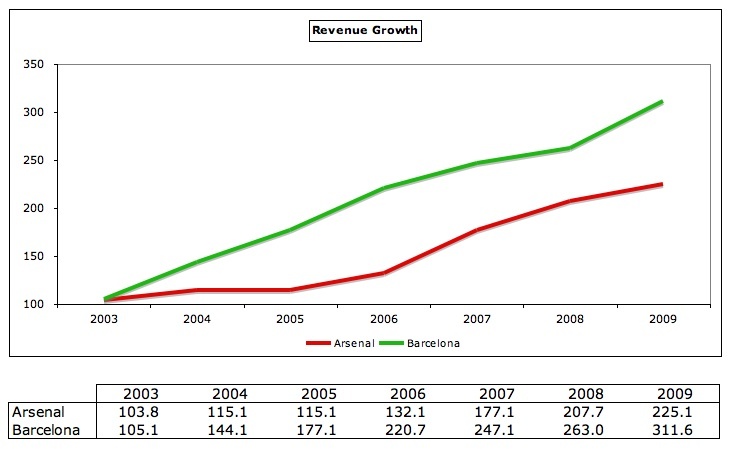 Similar to TV revenue, Barcelona’s commercial revenue of £95.4m is very nearly twice Arsenal’s £48.1m. We know that this is an area of weakness for Arsenal with their revenue lagging way behind the club’s English peers (Manchester United £70m, Liverpool £68m and Chelsea £53m), but we also understand why, as the club tied themselves into long-term deals with Emirates (stadium naming rights until 2021, shirt sponsorship until 2014) in order to provide security for the stadium financing. 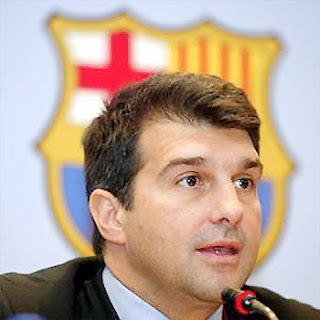 Although Barcelona are famous for not having a shirt sponsorship deal, instead having an innovative partnership with UNICEF whereby they fund some of the charity’s projects, Laporta’s regime is determinedly commercial with the club’s website listing 26 sponsors, providers and partners, including Nike who pay a guaranteed minimum of €30m a year (“the best deal in our history”, according to Laporta). Unlike English clubs, when Barcelona sign a player, they also retain a significant portion of his image rights, which allow them to make millions in advertising deals. The club also receive an incredible £18.7m a year from its museum. Arsenal chief executive Ivan Gazidis is well aware of the opportunities here and has recently restructured and strengthened his commercial team to explore new partners and overseas markets. Recent deals by other clubs highlight the size of the prize, which are conservatively worth another £20m a year. Indeed, Barcelona are a good example here, having increased commercial revenue under Laporta’s leadership from a paltry €39m in 2002/03 to €112m today. Arsenal’s interims told a similar story, though revenue from the football segment only grew by £1.8m (less than 2%) with property development being responsible for almost all of the club’s £40m reported increase in turnover. Again, this was more than off-set by the £10.1m cost growth to £101.4m, largely due to the £8.6m rise in player wages, despite the departure of Emmanuel Adebayor and Kolo Toure, who were on pretty high salaries, which reflected the re-signing of 17 first-team players on improved long-term contracts. 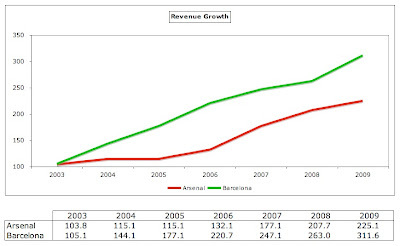 Although Barcelona’s revenue is significantly higher than Arsenal’s, so is their cost base. Their annual expenses of £307.7m are a full £113.4m more than Arsenal’s £194.3m. As always, the wage bill takes up the largest slice of the pie at both clubs: £104m at Arsenal and a jaw-dropping £171.5m (over €200m) at Barcelona. This still gives a respectable wages to turnover ratio of 55%, although not as low as Arsenal’s 46%, which admittedly is exceptionally good for a football club. Much of Barcelona’s huge staff costs is due to high variable costs of nearly £50m for bonuses payable for winning the treble, which was £28m more than the previous season when they did not win anything (third, in La Liga, semi-finalists in the Champions League and Copa del Rey). Even so, Barcelona has eight players in the list of the top 50 footballers’ salaries with Ibrahimovic £10.4m and Lionel Messi £9.1m being the best paid. Next in the list is Thierry Henry, so if he departs for the MLS, as expected, some £6.5m will be cut from the payroll. Arsenal only has one player on this list, Andrei Arshavin in 47th position with £4.1m, though Fabregas’ reported increase to £110,000 a week would result in an annual salary of £5.7m, taking him into the top 20. Clubs in La Liga have been helped by the so-called “Beckham law”, which allows foreigners in the top tax bracket to only pay 23% tax for their first five years in the country. In comparison, players in England now pay 50%. This means that clubs in Spain can either pay lower gross salaries to produce the same net salary as in England or pay the same salaries, leaving the players with a higher net package. It has been reported that this law is under review, but I don’t think that it has been revoked yet. The other meaningful operating expense is player amortisation, which reflects how much money has been spent on buying new players. The accounting treatment here is to write-off the costs associated with buying players over the length of their contracts, based on the (prudent) assumption that a player has no value after his contract expires, since he can then leave on a “free”. Barcelona’s amortisation of £46.4m is considerably higher than Arsenal’s £23.9m, but this is more due to Arsenal’s very low transfer spend than any profligacy on Barcelona’s part. As a comparison, Barcelona’s amortisation is quite similar to the other “Big Four” English clubs: Chelsea £49m, Liverpool £45.9m and Manchester United £37.6m. However, given last summer’s spending spree, I would expect it to be a fair bit higher next year. "Project Youth at its best"
Barcelona are not afraid to splash the cash, but they also recoup some of that outlay via player sales, which earned them £15.1m in 2009 (after £20.4m the year before). Of course, Arsene Wenger is also renowned for his ability to generate revenue from the transfers of players that he has developed. In particular, last year’s accounts include a profit of £23m from the sale of player registrations and that did not include the £42m received last summer for Adebayor and Toure from the City slickers. This is all very well, but what about all this debt that Barcelona is supposed to have? 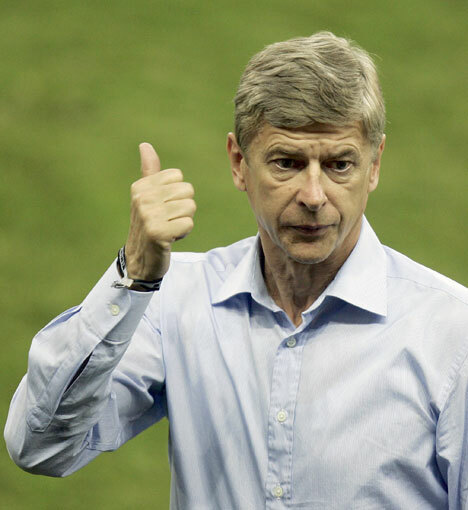 Strange – the accounts show that Barcelona’s net interest payable of £11.6m is actually lower than Arsenal’s £14.4m. Both of these are considerably lower than the annual interest payments at clubs with a genuine debt mountain like Liverpool’s £40m and Manchester United’s eye-watering £68m. We know that the solid progress on property sales has enabled Arsenal to reduce net debt by circa £160m in the last twelve months to around £175m with the property developments now being essentially debt-free, but what about Barcelona? So which figure is correct? In their own way, all of them. The definition of debt is “amounts owed to people or organisations for funds borrowed”, but this can be broadly interpreted. At the narrowest extreme, we have just the bank debt; at the broadest extreme, we can take total liabilities (“all financial obligations, debts, claims and potential losses”). It all depends on your purpose. The club clearly wishes to under-play their debt level, while a presidential candidate would obviously want to use the highest possible figure – which is exactly what they have done. Barcelona’s view is, “We have kept the level of debt stable and we hope to carry on lowering it”. Even after the costly purchases last July, they claimed that “the ultimate proof that Barca has a solid economic base is that we didn’t have to make any new debts when signing new players this summer.” As we have seen earlier, they are not unwilling to sell players, which would reduce any debt, though I’m not sure that they would want to make money on Messi (for example). "Sandro Rosell - he would say that, wouldn't he?" But do the provisions include anything that might be a sting in the tail? Yes, they do – a couple of nasty surprises, in fact. First, the club has provided €36m for a payment to the Spanish tax authorities following irregularities in the late 1990s, having already paid out €25m over the same issue for earlier years. Second, they have provided €16m against a claim made by TV company Sogecable. Trade creditors are normally just the cost of doing business, so personally I would not include them within debt, but even these include some “funnies”. For example, Barcelona owe nearly €50m to other football clubs on transfer purchases, ironically including €16m to Arsenal (€12m for Thierry Henry and €4m for Alex Hleb). These “disputes” don’t quite tie in with the club’s “holier than thou” image. There are many things to admire about Barcelona. Not just the way the team plays the beautiful game, but also the way that the club is structured, so that the executive is accountable to the club’s members with the president being elected every four years. Alfons Godall, another presidential candidate, said, “I believe ours is the best model, an example to England. We are free. We do not depend on a Mr. Abramovich. We want to be successful, but also to have meaning, social values.” It all sounds a little too good to be true and indeed there are some who consider Barcelona to be the football equivalent of Coldplay: a bit self-righteous, adored by the masses and just a little too free with their opinions. Their image would be rather more convincing if they didn’t spend so much time unsettling other clubs’ players, or if there weren’t so many empty seats at the Camp Nou. We don’t know what is happening behind the scenes with Arsenal’s captain, but if Fabregas does not end up at Barcelona, I don’t think it will be for financial reasons. The Catalans generate a huge amount of revenue, which they clearly budget to spend on improving their squad. Thanks to their productive youth scheme, they only need to make a few “marquee” signings every season, so they can afford to allocate a lot of money to one or two individual transfers. I don’t think that their debt levels would prevent them from making a bid, as the majority is derived from normal operations (trade creditors, provisions and accruals) and their bank debt is tiny. In any case, we have seen that Spanish banks are more than willing to lend to Barcelona and Real Madrid. Whether Barcelona would be willing to spend as much as £80m is another question, as every buyer has his limit, beyond which he will not go. Let’s hope that this is a case of an irresistible force meeting an immovable object. Were I dealing with them I would specifically state that Arsenal want the £80 million up front and should they shirt I would repeatedly and mercilessly ridicule them in the media for being broke and holding out a beggars cup hoping to get one of the world's best players. They would wish they hadn't given Guilleme ballague the go order then eh. very nice article, it's interesting to see that there are other clubs in the world going for a solid business model and performing at the same time. the only ingredient arsenal is missing is the prestige. is like honoring your reputation: we are a big club, we have to show both in commercial and football ways. for me, these days, arsenal look like a valencia: somehow successful, but easy to ignore since they don't really produce anything memorable. Just want to say how much I enjoy this blog. Thanks again TSR, A well researched and lucid article. I wanted to ask you about the debt. You say majority of it is derived from normal operations. Can you elaborate on that? I don't think I've seen such a high figure for other clubs. Is it because some of the P&L items have been moved to the balance sheet? Wouldn't it be strange if that was the case? Also I assume that if this is the cost of doing business, then it would be short term. Do they have the cash flows to handle this? Would it be incorrect or simplistic to say that each year they would pay off full or a major part of last year's liabilities, only to have fresh ones created for the next year? Or am I completely off track? In a very simplistic sense, I think that a liability has to be eventually paid off. So is this a healthy balance sheet or profit & loss statement? The world of Arsenal on the internet is full of abuse and hysteria but this article shows that an intelligent, balanced approach is far more informative. Many thanks. Thanks all for the kind words. As you may guess by the length of my articles, I put a fair bit of effort into my research, but it feels like it's worth it with comments like these. "repeatedly and mercilessly ridicule them" - that's a fine turn of phrase that genuinely made me laugh out loud. If we take the broadest definition of debt (€489m), most of it is derived from normal operations. Accruals total €106m (current €84m + non-current €22m). This includes accruals for costs which have been reflected in the P&L, but have not yet been paid. Confusingly, this category also includes deferred income, where payment has been received by Barcelona, but the club has yet to provide the services, so cannot recognise the income in the accounting period. For example, some of the money received from the Mediapro TV rights deal covers future accounting periods, so is booked here. The provisions are higher than I would expect, due to the disputes I mentioned above (tax, TV). Overall, it's a solid P&L - how many football clubs make a profit these days? However, if the TV rights were subject to collective bargaining, presumably leading to a significant reduction in Barcelona's allocation, it would be exposed. The balance sheet is also reasonable, as it has net assets, compared to many clubs which have net liabilities, but it could be healthier. You are absolutely correct that these liabilities have to be paid (and most of them are short-term), but Barcelona is a cash-generating machine, so I don't see that as an insurmountable challenge. To put Barcelona's total liabilities ("debt") of €489m (£417m) into context, Arsenal reported total liabilities of £639m in their latest accounts - and we're the good guys financially. A very nice read I must say. Thanks very much. I have received your emails and would like to thank you for your comments. I am very glad that you (and the rest of the Gooner family) enjoyed them. A very good article, intriguing stuff. clearly very well researched and balanced, its great to read some fact-based football stories rather than all the speculation these days! Although what i would like to know is how arsenal are somehow valued as the 3rd most valuable club in the world, after Man U and Real Madrid, with Barca coming in 4th?? How does club value relate to debt, income generation, growth potential, etc. Arsenal's total liabilities do throw some perspective on their debt! If it's not too much trouble can you give a break up of that. I can't understand how a football club has to pay 70 Mil to suppliers! 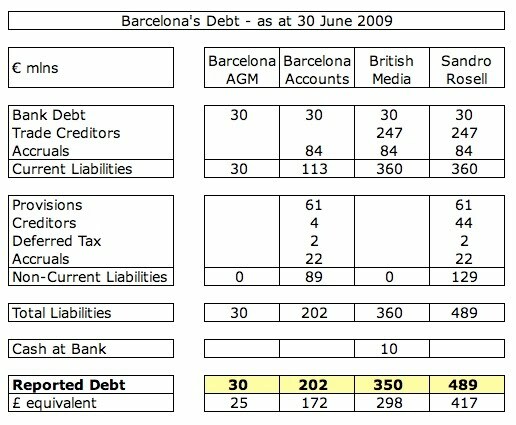 I'd noticed that Barca owed us 12 Mil in 07-08 accounts and also in the 08-09 accounts (For Henry). That made me wonder if they didn't have the cash to pay off the short term liabilities. Perhaps, it's just the nature of the payment schedule but it seems very strange that we would accept bulk of the payment 2 years down the line. They did make profits but I'm not sure their cash surplus would be so high that they can pay off 60 Mil in bonuses and 50 Mil in transfer fees in the short term. I mean if we analyze the cash flows, some of their contract money has already been received, then they have a huge wage bill each year which will eat up their cash and they have other expenses as well. I'm not questioning your opinion at all. Just some things that don't make sense. I tend to believe in the world of finance one can make black look white and white look black. Are Barca pulling it off? Good, well-considered questions. I will give them the full response they deserve later today, but I now have to go on a family bike ride! I assume that you are referencing the Forbes soccer team valuations? The basis for their ranking looks seriously flawed to me. Their definition for Current Value is “Value of team based on past transactions and current stadium deals (unless new stadium is pending) without deduction for debt (other than stadium debt).” In other words, if an owner has bought a club for an absurdly high price, funded by mountains of debt, then this is the starting point for the Forbes valuation. Nor do I know how Forbes can accurately source their data for stadium deals. As for “without deduction for debt”, need I say more? Not sure that I understand the argument about Barca’s stadium, as this is one area where Arsenal do earn more revenue than Barcelona (£100m vs £81m). However, I do agree with you that Arsenal’s financial future is very bright, though, like all major clubs, is exposed to non-qualification for the Champions League. I am afraid that Barcelona’s accounts do not further break down the €70m payable to suppliers. It does seem a little high, but nothing to be unduly worried about. I should advise you that Arsenal had already reduced their liabilities by over £100m to £527m by the time the interim accounts (for the six months up to 30 November 2009) were released, very largely due to a reduction in the bank loans from £129m to £42m. Since then, we know that the debt has been further cut, thanks to the Highbury Square property sales. My guess is that the payments owed to Arsenal and other football clubs are due to the nature of the deals. I cannot imagine that any club would allow Barcelona to plead cash shortages. Portsmouth, maybe, but not Barcelona. According to Barcelona’s annual accounts, they also owed money to Manchester United, Chelsea, Lyon and Monaco (among others), and I don’t believe they would all keep quiet on this unless it was part of the transfer conditions. Arsenal seem to operate in much the same way, as their annual accounts note that other creditors include £26m in respect of player transfers. That’s why it is dangerous to assume that Barcelona’s cash flow has been fully impacted by, say, the fee for Ibrahimovic. For all we know, that transfer was structured with a number of stage payments. I take your point about the cash flow, but we simply do not know all the timings, so cannot be sure either way. What I would point out is that Barcelona’s profit of €8.8m is after deducting over €90m of non-cash items, such as €62.5m of amortisation & depreciation and €20m of accruals. You are absolutely right that accounts are not as black and white as they may seem, but it is much more difficult to manipulate the cash flow statement than the profit and loss account and this does not look too bad for Barcelona. Firstly, Brilliant blog! I'm not in finance but I my aptitude and interest in the field keeps me coming back for more and your simplistic translations along with great flow of the article is highly engrossing! You should definitely put this mainstream media if possible! Secondly, have you discussed in what time frame can we expect Arsenal to be debt free? And that may have various interpretations in itself (i.e. free of bank loans, free of bonds etc.). The main reason for the question is to ascertain what type of funds may be available for Arsenal to spend in the transfer market on an annual basis? Granted that may not suffice as the wages to turnover ratio is low and must be maintained at a 50% mark approx so that will rule out singing someone in the top 20 pay brakcet! THat brings me to the next question, how many players can we afford to pay over the GBP 100,000 per week mark? 2? 5? I think that may be critical for example if we have the chance to sign someone experienced and successful on a free transfer (eg. Joe Cole) but we can't match the wages then we risk losing opportunities like that! Thanks in advance, and keep up the fantastic work! 1. I'm not sure that Arsenal are in a great hurry to eliminate their debt for a couple of reasons: (a) Ivan Gazidis has spoken about how some debt is "good" and Arsenal's is of the (relatively) cheap, long-term variety, as opposed to, say, Liverpool (which is extremely short-term) or Manchester United (which bears a prohibitively high rate of interest); (b) most of the debt is in the form of fixed-rate bonds, where the club would probably have to pay penalties if they were to redeem it early. Arsenal have to pay around £15m interest a year, which they can easily cover from their operating profit (£31m in 2008/09). This might reduce following the increase in salaries noted in the interims, but then again the revenue will almost certainly increase once more. What fans possibly don't appreciate is how important profit on player sales has been to Arsenal's overall profit (£23m in the last annual accounts - excluding the sales of Adebayor and Toure to Manchester City). 2. I attempted to calculate how much could be available to Arsenal to spend in the transfer market in an earlier article. This involved a few assumptions, so it would be even more difficult to attempt a similar analysis on an ongoing basis, as there are too many variables, e.g. commercial revenue increases, Champions League progress/qualification, number of matches played, wage bill, etc. It's possible, but would be very speculative. I actually think that there is scope to increase the wages to turnover ratio at Arsenal and think that this is what we will see in the next set of accounts. 3. The question of how many players we can afford is a very interesting one. The Arsenal wage bill is one of the highest in England (and therefore the world), but the allocation is very different to most clubs, as the younger, less established players are paid very well, but the first team not so much as other teams. It's a matter of balance, but my own view is that this policy should be fine-tuned in order to bring a bit more experience into the first team. So, if we were to dedicate a bit less of the budget to the reserves/youth team, it follows that we could have more players over £100k. Clearly, there could be a knock-on effect, as other players might then be seeking salary increases. Re someone like Joe Cole, there is a precedent for securing a player on a package of free transfer and high salary (Sol Campbell first time round), so I would not rule this out. i have just been reccommended this blog by terence, and i must say itis probably one of the finest footie finance blogs i have read. if this article is anything to go by. i think the distinction between good debt and bad debt is very important. i would be interested in your views on how the new uefa finance rules would affect the big clubs in europe, vis a vis qualifying for the cl. darn, this must be the longest blog post i have ever read! A brilliant piece of writing. Being as thick as two short planks when it comes to finance this piece has been excellent for me. The way you have explained this has helped me and I am sure many other Gooners too. Well done sir, keep it up. Top blogging yet again. Authoritative and detailed yet easy to read - thank you! I have spent much of my career simplifying financials for directors and senior executives, so you are in good company! Superb article, I have taken the liberty of linking you to my blog, so I can read any further updates! I hope you don't mind continuing this debate a bit further. As you rightly point out, Barca have ~90 Mil worth of non cash items. But if you look at their cash flow statement the cash increase is actually less than the end profit that they have shown! In other words, just like they have non cash items that reduce their profits, they have non cash items that increase their revenues. Isn't that true? Their cash reserves seem really poor at 10 Mil or so (or have I got this totally wrong?) I think Arsenal have cash reserves of around a 100 Mil. With low cash reserves, and with a lot of short term liabilities, they certainly seem to be walking a tight rope. thankfully for them, they have some really lucrative long term contracts but I have a feeling that if Arsenal ask for bulk of the money upfront, even a 30 mil deal for Fabregas might fail. You're half right. Their net increase in cash is €5.7m, which is indeed less than the pre-tax profit of €8.8m, but this is not because of other non-cash items in the P&L. It is because they have used the cash on buying assets, including new players. In fact, they spent €109.6m on "investment activities" and made up the shortfall by taking out the small bank loan. 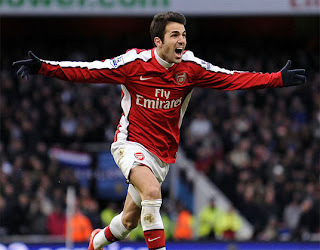 In my opinion, if Barca really, really want Fabregas this summer, they will simply follow the same approach, i.e. largely use their cash flow and if they are short (maybe after other buys), go along to their friendly local bank and ask for another loan. I agree that their short-term liabilities should give them pause for thought, but I'm not sure that it will stop them outright. The major factor might be whether Laporta really wants to leave the presidency on a major high by bequeathing Villa and Fabregas to his successor. Fantastic research combined with simplified explanations. Well done indeed. 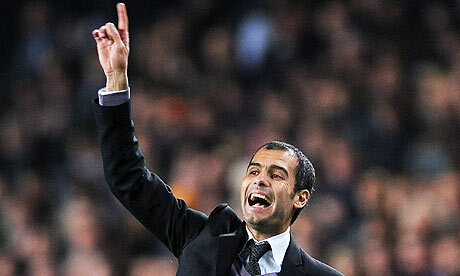 As a barcelona fan first of all thank you very much for giving a great insight into our club's financial situation. I have read other articles as well on this blog and must congratulate you with the detailed information and the simple explanations. This is brilliant stuff. I love you! Keep them articles coming! I'm glad that the analysis was also useful to Barcelona fans. It was intended to be a balanced article. that was fantastic. two cheers for that. helps me a lot for various reasons, mainly also to explain to people that debt is not debt. thank you very very much. This piece is superb - please keep them coming. Very well researched and also nicely written. Barca's tactic of trying to destabilize Cesc is nothing short of a disgrace. I guess Gazidis wants to step up our game in the commercial income department hence why Tom Ford was appointed. "Debt is not debt" - I always say that Economics belongs more to the Arts than the Sciences. Thanks. I'm hoping that the numbers don't overwhelm the words. Absolutely right. Once the Emirates shackles have been removed from the current deals, I am expecting great things from Arsenal's commercial team. Very enlightening, seeing as they already owe us £16 million what makes you think that they are going to stump up another 30/50 million on top of that? Great article! Just wondered if you know how much Arsenal are owed by other clubs for past transfers? And how much do Arsenal owe? Extremely detailed article. To think people do this for free. My guess is that the money owed by Barcelona to Arsenal is part of an agreement between the clubs, otherwise I would expect Arsenal to be shouting from the rooftops about this "debt". The same would go for the other 8 clubs owed money by Barcelona. Also, if this were a major issue for Arsenal, why would they have sold Hleb to Barcelona when they were still owed money from the Henry deal, unless this was an agreed, phased payment? My guess (and it's only a guess) is that selling clubs sometimes agree payments in stages for two reasons: (a) the overall price is higher; (b) it appeases their own fans, e.g. "yes, we sold Henry, but look how much money we got for him". Finally, these figures are from the last published accounts as at 30 June 2009. For all we know, Barcelona have now paid Arsenal this money. Good question. The latest accounts (interims as at 30 November 2009) report that Arsenal are owed £17.3m from other clubs, but owe £25.7m. Top article summed it up clearly. I was just wondering if you know the time frame for when Man United & Liverpool need to pay off all their debt. Secondly when will Arsenal spend all their profit (an estimate ) on the welfare of the team and not saving money on transfers with the debt in mind? Thanks Much Appreciated. United's gross debt is probably now up to about £730m, split between £510m for the bonds they issued in January and £220m for the notorious PIKs ("payment in kind") loans. Both of them are due for repayment in 2017. Liverpool's gross debt is £378m per the latest accounts, split between £234m bank loans and £144m owed to a company owned by Hicks and Gillett. The bank loan is incredibly short-term: it was due to be repaid on 24 January 2010 and then extended to 3 March 2010, but both dates were missed. Apparently RBS has extended this deadline by another six months to September, but only at the price of bringing in their own man to sell the club. Unfortunately, I have no idea when Arsenal will invest more in the team, but the money is certainly there. In connection with Barcelona owes to Arsenal: if I am correct Real Madrid owed to Inter with the last installment of Ronaldo (the real, not Cristiano) and Inter prosecuted RM. After, they get the defaulted amount. Thanks TSR for another great read. I can see that much time must go into your posts, rest assured they are much appreciated. In terms of Arsenal's commercial activities, how much can we expect that income to increase by over the coming years? Should we use Man U as a benchmark or Barca? We are also restricted I believe by Arsene's unwillingness to do pre season tours. I have often said that this commercial revenue is an area where Arsenal (and other English clubs) have a big opportunity to grow their revenue without fleecing the fans. New chief executive Ivan Gazidis is acutely aware of the revenue left on the table when the club (understandably) committed itself into long-term contracts with Emirates (stadium naming rights until 2021, shirt sponsorship until 2014) and Nike (shirts until 2014) in order to provide security for the stadium financing, but the huge revenue earned by the likes of Barcelona (and Bayern Munich) only emphasises the size of the prize. Conservatively, I would expect Arsenal to be able to increase commercial revenue by at least £20m once the Emirates restrictions are off and maybe more if they went further afield than Austria for the pre-season tour (as you suggest). Do you know whether Arsenal's new marketing team is the first of its kind in the premier league in terms of the level of expertise being hired? I can't recall ever hearing about anything similar at another club. Yes, you're right. It is certainly true that net current liabilities increased between 2008 and 2009 - by about €140m to the €200m you mention. As I said above, most of this imbalance is due to creditors, i.e. payments to other football clubs, bonus payments owed to Barca's players, tax authorities, etc. Much of this can be financed by the operational cash flow, but I agree with you that it is certainly possible that Rosell may need to extend their credit facility, especially if: (a) they make any more big money purchases like Fabregas; (b) they fail to move on players like Ibra or Yaya. Thanks for your interest and your perceptive comment. So dont worry Arsenal fans!!! Suprised me to see that Barca are not as bad as some of the spanish media has said. I noticed you said in your post that the Beckham law may be under review and also Wenger spoke about La Liga, touching upon the TV rights. I have a question, IF those 2 changes we're to happen then how would that effect the Barca books? Arsenal are already crippled by the players tax and not being able to negotiate our own TV rights, so if Barca had the same handicap then how would it look then? Like you, I look forward to their next annual report and I also would not be surprised if their bank loans had increased. 1. If the Beckham law is revoked, then the Spanish clubs would have to pay higher gross salaries in order for their players to receive the same salary net of tax, which would obviously inflate their wage bill. Alternatively, they would pay the same gross salaries and be less attractive to foreign players from a financial perspective. 2. La Liga is now the only major football league that does not have a collective agreement for TV rights, which obviously hugely benefits Barcelona and Real Madrid. If this changes, then you have to assume that their revenue would significantly decrease. Difficult to say by how much, but it's clearly a major advantage for them commercially. This article is superb! I read quite a bit of Arsenal material, but have yet to come across one as informed, methodical and interesting as this one. Kudos, keep up the good work. Thanks very much. Each article takes a lot of research, but I do enjoy it! Many thanks. I've just taken a peek at your own eclectic blog, which also has some very good stuff, including interesting interviews with some of my favourite bands (Eels, Frightened Rabbit, Mercury Rev, etc). I would like to commend you for a well written and extremely interesting article! This is the first time I have read your blog, but I will certainly return for more. Thank you for putting in all the hard work, it is greatly appreciated. Great article,thanks! Would you be able to do a similiar,in depth,probe on the ManUtd.situation? It's certainly time the real state of the club was exposed. Thanks. I'm happy that the hard work is appreciated. Thanks very much for the very detailed look at the situations for both clubs in financial terms. Have you ever looked at American sporting models? I'm interested because you see players like Joe Mauer getting a 180 million USD contract extension paid over 8 years. How is it that a relatively small market baseball team can afford astronomical wages like that? This is especially interesting given that the Twins (Mauer's team) have just moved into a brand new stadium which obviously cost them money to develop. I'm interested in this line of investigation because it most likely shows that there are significant opportunities for Arsenal (and others) to improve their revenue streams. I imagine that's where Ivan Gazadis comes in with his new team of back room staff. Thanks for the blog and any insight you can give me on these points. Just found this blog via a bbc article. Love it and will be following it via the RSS...keep up the good work. Would love an article into Liverpool's finances. And true valuations of the club. I'm not really an expert on American sports finances, but I may well take a look for the very reason you suggest, namely lessons that could be learned by football clubs. One thing that is very obvious is that English tams have been very slow to capitalise on commercial opportunities, probably as they have grown complacent with the constant increase in TV money. Thanks. I hope to finish a new article soon - in between World Cup games. Let me know if you have any questions about the general baseball structure (should you decide to look into American sporting structures and their ability to pay these wages). I do suspect the fact that there aren't transfer fees (only player for player/draft picks) in trades may well contribute to this. Not to mention the cap system. I never post on blogs or message-boards, but I truly, truly enjoyed this article. It seems as though it means something to you that people like your blog. Keep up the good work! I was wondering how easy it is for someone like Hicks and Gillette to come along and overnight put hundreds of millions of debt directly on the club due to their ownership. Is there anything in the structure of the club to stop this happening? I was just wondering what do these big clubs do to hedge against their foreign exchange risk? Forward Contracts etc? and do they make any significant profits from these? There is nothing legally that would prevent an acquisition of the club being financed by debt, but any purchaser would have to convince the many different shareholders to sell on that basis. You also have to ask yourself what return any purchaser would get from such an investment. He's hardly likely to receive large dividend payments, as the operating profits would probably be eaten up by hefty interest charges. From a financial perspective, any return is likely to be capital growth, i.e. sell the club on for a higher price at a future date. This is clearly what Hicks and Gillett hope to do at Liverpool. The question I would ask with Arsenal is whether an investor could achieve a good return, given that they would have to pay top dollar to acquire the shares? On the other hand, Arsenal will be a "cash cow" with the stadium throwing off cash and plenty of upside on the commercial side. Clubs do not have a significant amount of foreign exchange risk, but have some due to participation in the Champions League and player transfers. They will hedge this exposure, but will not really aim to make a profit. Mighty fine wrastlin' right there! Interesting development with the Barca players not being paid this month and the club looking for an emergency loan of 150 millions euros. Untold Arsenal has a post on it. How quickly things can change in less than a year! Yes, I saw that and commented on it. I have written a comprehensive response in the comments under my latest blog on the Football Association, if you're interested. In short, their total liabilities have only slightly increased since last year, but the bank debt is now a higher proportion. My guess is that this is a combination of the club sorting out the creditors (essentially swapping ST liabilities with LT debt) and some politics from the new president. Well, it adds something to the extent that those figures refer to the latest accounts (2009/10), while my analysis was based on the previous year (2008/09). However, in essence, not much has changed: they still made a small profit (€9m); revenue is still very high (up to €446m); but costs (and salaries) are also very high (up to €437m). The issue with Barcelona is that they have a lot of liabilities, but not a huge amount of bank debt, though this has increased over the last 12 months following their frenetic transfer activity last summer and, of course, the purchase of David Villa a few weeks ago. Total liabilities have increased over the last 12 months, but not by a huge amount (from €489m to €518m), though the bank debt is now a higher proportion (up from €29m to €114m). So, as the Guardian piece indicates, the challenge for Barcelona is that they must meet these ST liabilities - like tax payments and payments to other clubs (as I outlined in my article). This impacts on cash flow, which suffers when you have high ST payables. Often, when clubs have problems with debt, it’s not so much the magnitude that’s the problem, but the timing of the repayments. This is why Arsenal’s LT debt is not a concern, but Liverpool’s ST debt is. My guess is that Rosell is looking to replace the short-term payables with long-term debt, as they need to pay outstanding fees to other clubs, tax authorities, etc. To a certain extent, they are also paying the price of their success on the pitch, as this has triggered hefty bonus payments to the players, which are probably now due. Looking at Barcelona’s presentation, there are some scary figures that indicate the logical result of their player acquisition strategy: salaries have increased by 18% to €234m; player amortisation has risen by 32% to €71m. Barcelona’s wages to turnover ratio has also increased to 57%, though this is still a lot better than most clubs in the Premier League. The most threatening issue for Barcelona could be the problems at Mediapro, who are seeking bankruptcy protection. Strangely, Barcelona appear to have a different deal with Mediapro to Real Madrid with only verbal payment guarantees. Of course, there’s a broader danger here, as the other clubs in La Liga attempt to implement collective bargaining with its potential implications for the business model of the “big two”. I also wonder whether there is an element of politics here. 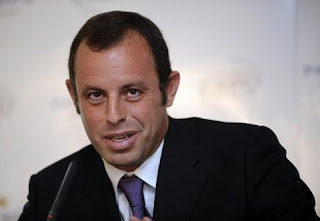 Rosell was elected on a platform of sorting out the financials, so he is hardly going to say that everything is hunky dory once he’s put his feet under the desk. Furthermore, the new president might be getting all the bad news out of the way early in his tenure, so that any problems can be blamed on his predecessor. We see this type of behaviour time after time when a new CEO starts his job in a company in the “normal” business world. With MediaPro since filing for Bankruptcy protection, and risking the loss of 150 million euros in revenue for the club. As well as the addition of 150 million euros in debt (with an approximated 5.25% interest rate based on Spanish Bond issues). And an addition 7 million Euro in wages (+David Villa (12m) -Toure (3m) -Chygy(2m)), and rapidly increasing wage payouts relative to revenue growth (18% vs. 10%). How likely is it we will see FC Barcelona filing for bankruptcy within the next 2 seasons? It would seem as if Costs will soon be greater than Revenues, and the debt payments are mounting.. Is it me or is Rosell going to be captaining a Titanic? My views are in the comment above yours, but I would consider this unlikely. If Mediapro's problems result in no payments, it's difficult to believe that another TV channel would not want the broadcasting rights. They might pay less, but I doubt whether Barcelona's TV revenue would disappear altogether. 1. Raise the membership fees. 2. Sign a lucrative sponsorship deal. Plus, they have plenty of scope to reduce costs, e.g. they have removed Henry's high salary from the wage bill following his transfer to New York. They could also renegotiate their bonus scheme, as this has cost them a huge amount over the last two seasons. I think reports of their demise are a little premature. Are Liverpool A Good Investment? Does Arsenal's Policy Make Sense?